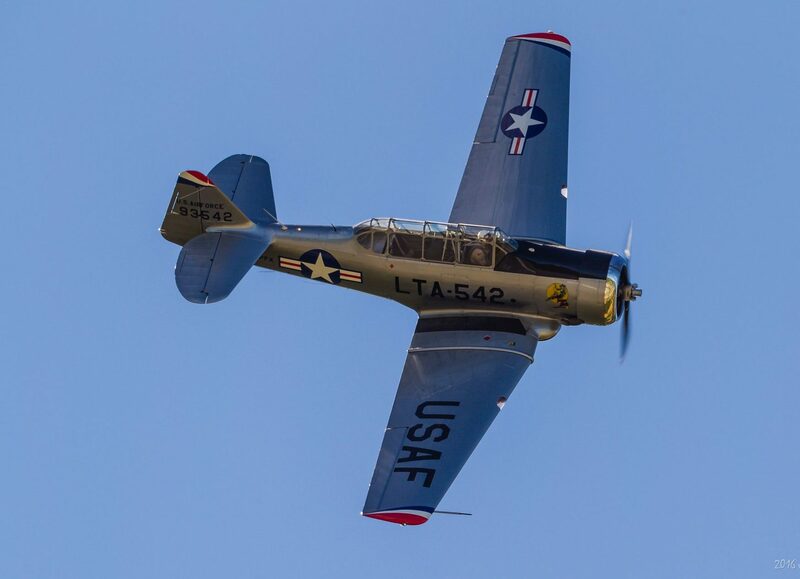 The North American T-6 Texan is a trainer that was used for further training of pilots after they had finished basic training in the Boeing Stearman. After training in this aircraft pilots went on to serve as fighter pilots or bomber pilots during World War II. AT was the American abbreviation for Advanced Trainer, but after 1948 all trainers got the prefix T, and AT-6 Texan was T-6 Texan. In British and Canadian service the planes name was Harvard, and this name was used also used in Norway. The plane was also used after World War II carrying bombs and other weapons in the Korea and Vietnam wars. Hundreds of thousands of pilots from 34 countries were trained on the aircraft over a period of 25 years. South Africa used the plane as trainer until 1984. The plane was well fit as a training aircraft, easy to maintain and they had a lot of the same characteristics as contemporary jet fighters. They did not have the same speed, but was more maneuverable and able to do all aerobatic maneuvers. The plane is relatively difficult to control and are referred to as «the pilot maker». Can you handle a T-6 / Harvard in all conditions from the rear seat, you can fly anything. Today the plane is a popular veteran in private ownership worldwide. There are several formation acro-teams using it in airshows, especially in the US. There is also a separate class for the Harvard at Reno Air Race held in Reno, Nevada every year in September. Norway’s Air Force used the aircraft as trainer from 1945 to 1956 and had a total of 24 aircraft that were delivered through a «lend lease» agreement. Our own Harvard is stationed at Notodden Airport and owned by Scandinavian Aircraft AS. Aircraft Norwegian registration is LN-PFX. 1952 built as Harvard 4 by Canadian Car and Foundry at Fort William (Thunder Bay), Ontario, Canada. Serial number CCF4-194. October 1952 – 23. May 1965 included in the Royal Canadian Airforce as S/N 20403. Flew here in the famous demonstration team RCAF «Goldilocks Aerobatic Team». March 1987 sold to Courtesy Aircraft, Rockford IL, lisence in the US was N90448. 1988 sold to Alan Brast, Livermore, CA. August 1989 sold to G. Lloyd Owens, North Weald, UK. December 1991 sold to Barbel Christa Abela. April 2016 bought by Scandinavian Aircraft AS, with license LN-PFX i Norway.